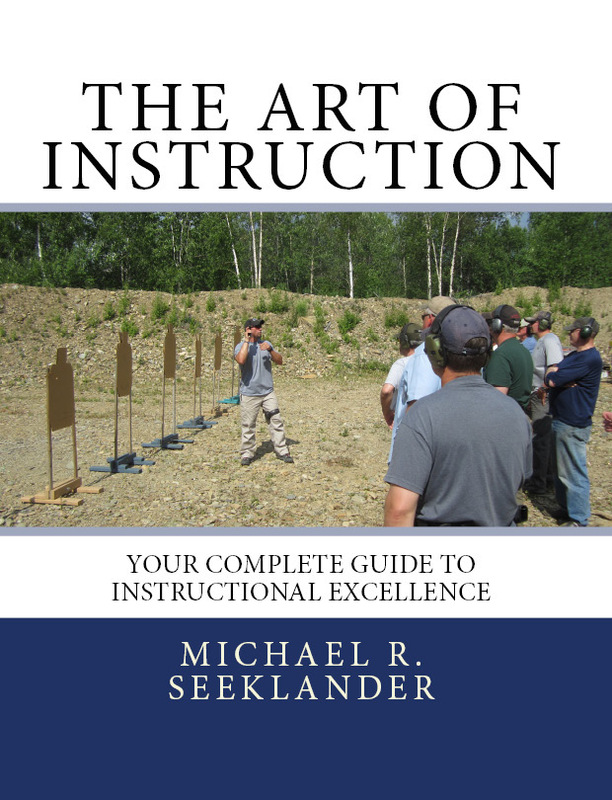 The Art Of Instruction – This article was taken from a chapter in this book. “failure point cycle” concept is a critical thing to understand when trying to push yourself to the next level!! For you instructors reading this, please use the concept to push your students…but make sure you do it safely! I recently taught a class in Hampton, South Carolina, and in this course I had a repeat student. Repeat students are often more advanced, because they have gone through training before. I had a class that was highly varied in its skill, meaning I had some very low-level students who were quite new students; but I also had a couple of very high-level students with considerable skills. The first two or three repetitions of the drill, I tried to catch him—to draw and fire and get a good hit, with me starting when I saw him start to draw. That pushed his pace, and he started to make mistakes. Then, when it was my turn to go first, he tried to catch me—and he made even more mistakes. He thought he was pretty good, and my intention wasn’t to cut him down—it was to show him where his skill broke down and needed more work. Paul’s trouble came with the portion of the concealed draw process where he was to sweep his shirt up and out of the way and get an effective grip on the handgun. If you miss your sweep or you miss your grip on the handgun, you’re going to be behind the curve or not have a solid grip for accuracy. If he missed either of these things, it affected his performance—so we knew this was what he needed to work on at normal speed. “Sorry, that was a bad shot,” he said at one point. “Well, what happened?” I asked. He knew. “I missed the grip on my shirt,” he told me. He knew he’d then rushed everything else. Learning at speed had uncovered a mistake he could work on with more repetitions at a deliberate pace to refine his fundamentals. The point of these drills isn’t necessarily who wins or loses them; again, it’s to help bring mistakes in form or style to the surface so we can address them. A lot of times, an advanced student will not be challenging him or herself during the normal class drills because of his skill and confidence. He probably also will realize that he is more advanced than most of the students in the group, which makes the training environment stress free. But when I go up against him and start pushing his pace and add that stressor, he will start to make mistakes. The key is that once he makes a mistake, I ask him what he did wrong right away, while it’s fresh. If you’ve done your job as an instructor, he will often be able to tell you—if not, tell him how to correct it and move on. The same concept applies to training by yourself. The instant you make a mistake, figure out what that mistake was and work on just that area. Don’t repeat the entire drill again until you fix it. What you’ll find more often than not is that when students (or you) start to make mistakes and the wheels fall off, they’ll get it and know what they did wrong. This is a very powerful way to help students (or yourself) learn, and if they can learn to self-correct, it’s huge kudos to you (the instructor)—you’ve done your job, and the students understand the technique. I like to leave students with this thought after challenging them: “This is the pace I want you to push—I want you to push to your failure point, and then I want you to correct the technique. Back off the pace, correct your error, and then push your limits once again.” The process is a cycle: push – fail – fix – push. 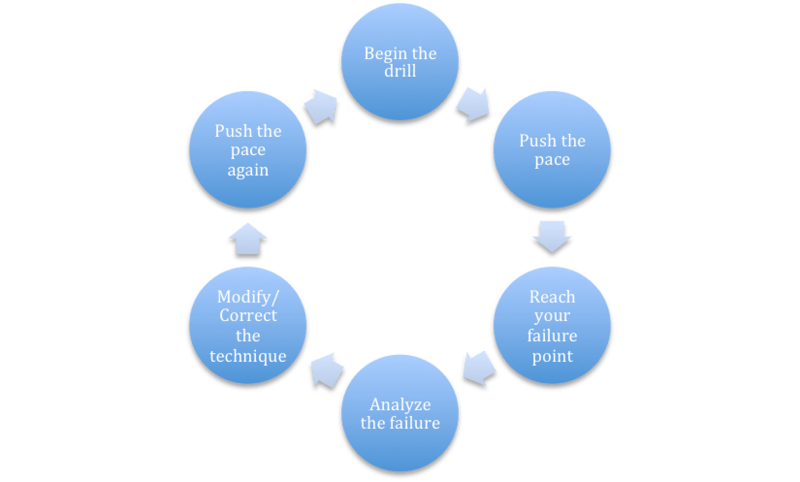 This picture shows the failure point cycle, a key to improvement during goal-ceentric practice. Click to enlarge. Another great technique is to line the students up with the really good shooters on one end and less skilled shooters at the other. This way the students are often near someone close to their skill level, more advanced, or less advanced. I will then pair the group up have the students do this Catch-Up Drill with each other, pushing the pace of drill and finding failure points. We often learn when we are trying to do a skill at speed. When students try to push (the pace) against you, they will make mistakes. Teach them to continue with the drill and not quit, but then to evaluate what they did wrong—and then to refine their fundamentals with more repetitions. Students will benefit from performing drills at higher speed, and their ability to recognize good or bad technique will improve with challenges like this. This concept can really be applied to any type of drill, as long as it is done safely. Challenging a student (or yourself) pushes them into Zone 3, which is where we go into redline. We should not try to operate or compete from here, but when students get into this zone during training, we can see holes in their skillsets from performing outside of the confines of what they can control. Note, I do not mean “unsafe”—we’re talking about a zone where they are going too fast to be in total control, while still remaining safe. Sometimes we must push into that uncontrolled zone to go to the next level. Near the beginning of the book in my Theory of a Miss section, I talked about negative triggers that decrease our performance. One of these was the fear of failure, and this is an excellent time to teach your students not to fear failure but to embrace it and learn how to use it to make them better. Remember, fear of failure is the most common emotional trigger, and students will tie failures to their self-image if we don’t help them learn how to channel it into a positive. Failure is part of life—but we typically only fail when we try to do something we haven’t tried before or when we push ourselves. We don’t want our students (or ourselves) to not push their skills, but when we challenge them they will eventually fail and make mistakes. Challenges are the perfect setting for using this positive view of failure as a training tool. We change the fear of failure by changing the way students (and we) think. We can train them so see failure as something so positive and powerful that, if used correctly, it will drive them to future success. Remember, failure is the motivation that has driven all great successes. Use a logbook or system to track your results, so you can find ways to push the envelope. Don’t be afraid of failure during your training. Use it to help yourself grow. Make sure you stay within safe training parameters when using this concept. Train with a partner or timer, and use either one to push your pace once you have safely ingrained the initial skill. This technique can be done during dry fire as well. Mr. Seeklander, Thank you so much for this valuable insight. I’ve been train my 26 year old daughter to shoot Steel Challenge for the last 8 months. She has advanced very quickly, but has reached a plateau where she doesn’t seem to be gaining any speed. I’ve been teaching her that Steel Challenge is all about accuracy, 1st shot speed, and transitions. Her favorite stage is Roundabout. She consistently shoots 2.40 to 2.25 (rimfire) on this stage. I would like for her to be in the 1.80’s, but that last .5 of a second is hard to eliminate. I will try your instructions in this article and see if we can use them to knock off some time. Thank you for the instruction. Douglas- Thanks for reading! Just remember to tell her that the idea is to push until she fails, and then try to fix that key area. Don’t fear failure, learn from it! Another neat tip for Steel Challenge is to actually shoot the stage dry fire, as it identifies errors you are making that you may not see. Good luck! ← If Everything Is A Priority, Nothing Is!